The Iberian Peninsula has once again been engulfed in protest, as police used brute force to disperse thousands in front of the Spanish Parliament in Madrid while in Portugal citizens climbed on top of a tank to make themselves heard. 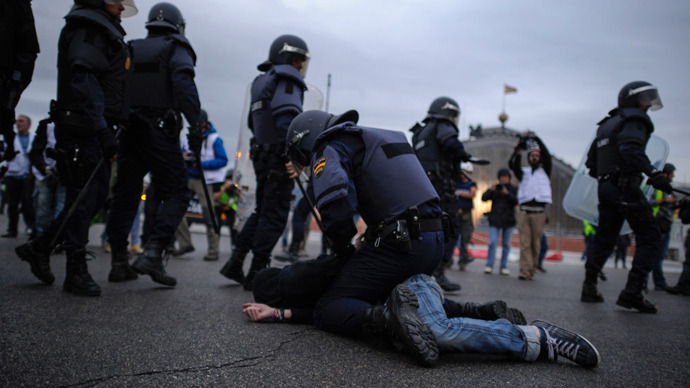 Police detained at least 15 in Madrid, including one minor, as they used force to quell an angry mob of protesters near the Spanish parliament, united under a “Besiege Congress” slogan calling for the government to quit. The riots come as Prime Minister Mariano Rajoy is set to announce a raft of measures on Friday aimed at tackling the country's recession. An estimated 1,400 policemen were deployed around the chamber as politicians cancelled the session for the day. Law enforcement charged the protesters with batons and shot blanks in the air as the demonstrators threw bottles and rocks at the police. Earlier in the day five people, including one minor, were arrested for allegedly plotting to set fire to a bank. According to Spanish media, Molotov cocktails were also planned to be used in the riot. Four of those detained were part of an anarchist cell suspected of arson in the capital, the Ministry of Interior reported. The minor, arrested in Puerta del Sol, was apprehended with materials necessary to make a Molotov cocktail. Another 11 people were arrested for carrying clubs and chains and allegedly provoking riots in the Universidad Complutense zone in Madrid. Authorities say the arrests were caused by “resistance and disobedience to authority and refusing to identify themselves." Police say at least 14 officers were injured in the clashes. The protest coincided with the latest jobless rate announcement that stands at a record high of 27.2 percent in the first quarter of 2013, according to National Statistics Institute. The number of unemployed is now 6.2 million as the Spanish economy finds it impossible to climb out of the burst property bubble of 2008. In Lisbon, tens of thousands of Portuguese flooded the streets on Thursday to demonstrate against austerity measures and to mark the anniversary of the 1974 Carnation revolution against the dictatorial regime. 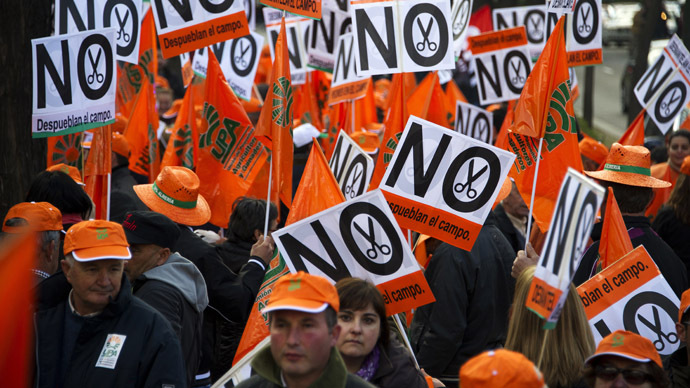 Protesters were wielding flags and posters demanding the center-right government step down and an end to austerity measures. Parasols of the Portuguese Communist Party and the Portuguese opposition party shielded participants from the sun, while a group of activist climbed on top of a tank trying to make their voices heard. Usually a national celebration of triumph of democracy, this year the revolution anniversary has been hijacked by the pressing austerity issues of pay cuts and tax hikes that were imposed following a €78 billion ($101bn) bailout from the European Union. The crowd has also voiced frustration with the international lenders, the so called troika consisting of the IMF, EU and ECB, who the public increasingly blame for the economic hardship in the country. “Troika means austerity and we have been experiencing for more than a year and a half the austerity measures which have destroyed every good prospect of social state, of welfare state. Now we have over a million and a half unemployed.” Joao Camargo, anti-troika activist told the RT crew on the ground.